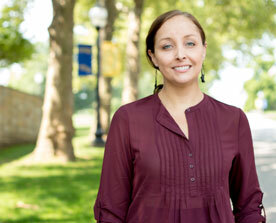 As an admission counselor at Juniata College, Holly’s goal is to show each prospective student the distinctive educational and community experience that Juniata has to offer. Holly was raised in the Central Pennsylvania area but left the northeast after graduating high school to attend the University of Tampa. During her college experience, Holly was lucky enough to study abroad in Australia and spent three months backpacking through South East Asia during her sophomore year. She later earned her B.A. in Communications and an A.S. in Forensic Science. After spending a number of years traveling the United States and the world, Holly decided to come back to her native Pennsylvania and joined the Juniata College enrollment team in 2014. When she isn’t going on international adventures, Holly is running 5k races and enjoying the great outdoors.